A hugely successful ramen bar in central London, SHORYU RAMEN specialises in Hakata tonkotsu ramen from Kyushu. Made with a thick, rich pork soup, our tonkotsu ramen originates from the Hakata district of Fukuoka city in Kyushu, southern Japan. Shoryu’s recipes have been specially created by our Executive Chef, born and raised in Hakata, to provide highly crafted, genuine tonkotsu rarely found outside Japan. Open until July SHORYU POP-UP will serve Shoryu favourites as well as dishes unique to the site, if you like your ramen informal, intimate and in the thick of it, head to our second location in London’s Soho. 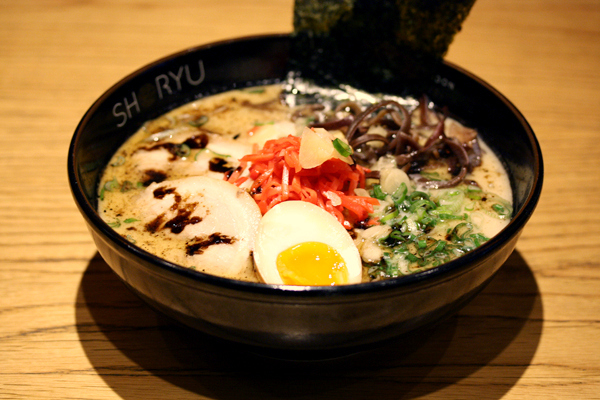 Our second ramen bar SHORYU SOHO will open fully next door to the same site later this summer! Use our 10% OFF POP-UP VOUCHER to get money off your final bill by printing it out and bringing along when you dine. Terms & Conditions: For use at Shoryu Pop-Up 3 Denman Street Soho only. Valid 1st May – 31st July 2013. One voucher per person, cannot be used in conjunction with any other offer.